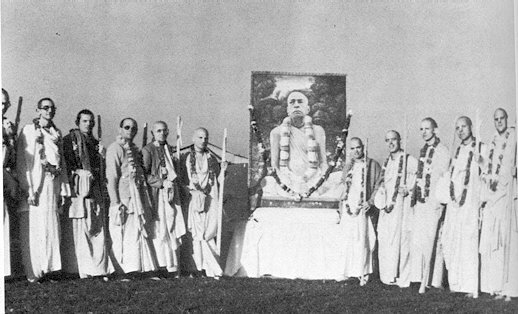 Before Srila Prabhupada left his body he named some disciples who could give ritvik initiation (accepting Srila Prabhupada’s disciples on his behalf). These devotees could chant on the beads and initiate new devotees, but these new devotees would be disciples of Srila Prabhupada, not their disciples. Tamal Krishna, Prabhupada’s secretary at that time, outlined the whole procedure in a letter sent to all temple presidents six months before Srila Prabhupada left his body. Srila Prabhupada had followed his spiritual master Srila Bhaktsiddhanta Sarasvati Thakura by not naming an acarya to take over his position, instead, he had formed a governing body, the GBC, which was to cooperatively manage the preaching. He already had a system in place enabling a number of his disciples to initiate disciples on his behalf, they would still be Srila Prabhupada’s disciples, not disciples of the devotee who was performing the initiation ceremony. There are many indications that Srila Prabhupada intended this system to continue after he disappeared from our material vision and there are absolutely no indications that he approved of these devotees taking over ISKCON as his successors. Unfortunately the Gaudiya Math advice was the men named by Srila Prabhupada as ritvics should be treated as non- different from Srila Prabhupada. They were acaryas in their own right, entitled to sit on highly elevated vayassanas (seats), entitled to the title paramahamsa (the topmost devotee) and names like Visnupada and Bhaktipada, almost on the level of Prabhupada. Overnight these devotees became “rubber stamped” as pure unalloyed devotees and were to be worshiped on the same level as Srila Prabhupada. There was no question of of Srila Prabhupada’s other disciples ever reaching the status of “zonal acarya”; in fact, Srila Prabhupada’s disciples were expected to worship these “zonal acaryas” as if they were their disciples, if they refused there was no future for them in ISKCON. All emphasis was placed on pleasing the “zonal acaryas” and Srila Prabhupada was put well into the background. It was considered offensive for a devotee to directly worship or approach Srila Prabhupada. He could only please Srila Prabhupada by pleasing the “zonal acarya.” Even disciples of Srila Prabhupada were expected to follow this procedure. Any new devotee coming to ISKCON had no choice but to take initiation from the “zonal acarya” in his area. There was no room for questioning. If anyone did question the “pure devotee zonal acarya,” it was considered blasphemy and he didn’t have much chance of staying in ISKCON. From the beginning an intelligent person who had studied Srila Prabhupada’s books could see the flaws in the “zonal acarya” system. Because speaking out against the “zonal acarya” was considered blasphemy a devotee who could see problems had to either keep his mouth closed and take initiation from the “zonal acarya” or leave. This system made ISKCON a laughing stock for the Gaudiya Math and also for many Indians who were well aware of the actual qualifications of a spiritual master. 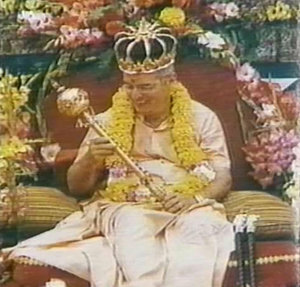 Although the ISKCON “acaryas” were confident they were pure devotees on the same level as Srila Prabhupada, anyone looking on from outside the movement who knew the qualifications of a pure devotee could see how ridiculous this was. Prabhupada’s godbrothers and his so-called “leading disciples” had succeeded in destroying the credibility of ISKCON which Srila Prabhupada had fought so hard to establish. And still no one in ISKCON seemed to know what was happening. Many young people were attracted as a result of the devotees preaching and from reading Srila Prabhupada’s books. They came to ISKCON and accepted these “zonal acaryas” on face value. All the devotees in the temples were praising them as pure devotees (anyone who didn’t was thrown out) and they seemed to be advanced devotees. Many of these young people took initiation from the authorized “guru” in their area. That was their only option – there was no other way according to the ISKCON devotees. These new devotees were not aware of the poisonous effects of Mayavada philosophy which by now were spread throughout the entire society. They didn’t even know what Mayavada philosophy was! Once they joined the movement they received little training in Krishna consciousness, they were not encouraged to read Srila Prabhupada’s books. The main program was to make money for the temple. The result was most of these devotees never really understood what Krishna consciousness was and therefore didn’t experience any spiritual pleasure. This was because they were not following the process given by Srila Prabhupada. It was not their fault… The ISKCON devotees were not actually presenting Krishna consciousness any more. Everything had changed. Instead of always thinking of Krishna and distributing Srila Prabhupada’s books the devotees were now always thinking of money and selling anything and ev- erything they could lay their hands on, simply to make money. Many new devotees left after a short time because there was no pleasure or satisfaction at all in ISKCON anymore. The preaching was contaminated with Mayavada poison so just by listening to the classes devotees would loose any attachment they may have had for personal devotional service to Krishna, the Supreme Personality of Godhead. These devotees either left, became contaminated themselves and joined the “Mayavadi” club, or became unhappy and frustrated within ISKCON. "Srila Bhaktsiddhanta Sarasvati Thakura suggests that people who are materialistically inclined and sahajiyas, or so-called Vaisnavas who take everything very casually, are both visayi, materialists. Eating food offered by them causes contamination, and as a result of such contamination, even a serious devotee becomes like a materialistic man. There are six kinds of asso- ciation - giving charity, accepting food, offering food, talking confidentially and enquiring confidentially. One should very care- fully avoid associating with the sahajiyas, who are sometimes known as Vaisnavas, and the non-Vaisnavas, or avaisnavas. Their association changes the transcendental devotional service of Lord Krishna into sense gratification, and when sense gratification enters the mind of a devotee, he is contaminated. The materialistic person who aspires after sense gratification cannot properly think of Krishna. The organization built by the “zonal acaryas” was not Krishna consciousness. It was guru consciousness. Everything was centred around pleasing the guru and blind submission and surrender to the guru. Of course submission and surrender to a bona fide guru is good… even if it is blind faith. But the real spiritual master does not encourage blind sentimental following. He establishes Kr- ishna consciousness scientifically and authoritively from the authorized scriptures and trains his disciples in Krishna consciousness to enable them to thoroughly understand the philos- ophy. However, if a disciple doesn’t take advantage of his spiritual masters training, if he has faith in Krishna and his spiritual master and follows strictly the regulative principles of devotional life and chants at least 16 rounds daily, the end is the same. He is Krishna conscious. The difficulty is devotees who don’t have a solid philosophical understanding are usually not very fixed in their devotional service. Such philosophically naive devotees are also prone to exploitation. Because they don’t know the philosophy of Krishna consciousness they have no way of determining if the directions of the other devotees are correct. They are also unable to select a bona fide guru – they can’t tell maya (illusion) from Krishna. Basically they are religious fanatics. Srila Prabhupada so often referred to religion without philosophy as sentimental or fanatical. The “zonal acaryas” themselves had no ability to preach and no real understanding of the philosophy of Krishna consciousness so they couldn’t attract intelligent disciples. They couldn’t properly present the philosophy of Krishna consciousness. Only the envious and the sentimental were attracted. Of course many intelligent people read Srila Prabhupada’s books and were attracted by Krishna and Prabhupada, but usually their intelligence enabled them to see the devotees in the temples were not following the instructions clearly given by Srila Prabhupada in his books. So most intelligent persons didn’t join the movement and the ones that did usually got such a hard time from the devotees within ISKCON, who saw their intelligence as a threat, didn’t stay long. If somehow an intelligent person did stay within ISKCON he also became contaminated by the Mayavada philosophy and became just as bad as the others. The power of association is very strong. 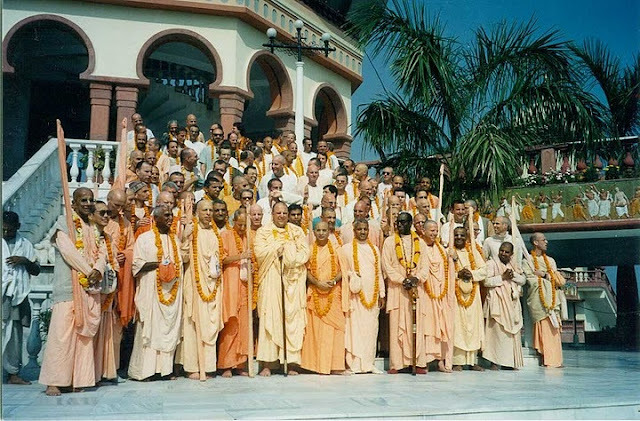 ISKCON quickly became an organization that took innocent people and under the guise of educating them in Krishna consciousness proceeded to do just the opposite. Everything looked and felt almost like the same Krishna consciousness Srila Prabhupada had established. Actually the movement seemed to be booming… going forward with great leaps and bounds. There were more temples, more devotees, more of almost everything. So things appeared to be suc- cessful. However it was all maya (illusion). The purpose of our lives, our whole existence, is to render service to Krishna, the Supreme Personality of Godhead. Actually we have no other business. If we try to gratify our own senses it will end in frustration and suffering, no matter how attractive the sense gratification appears in the beginning. However, if we work for the satisfaction of Krishna’s senses, our natural constitutional position, we will enjoy transcendental bliss, ever increasing ecstasy on the spiritual platform, even though it may appear like poison in the beginning. It is a prerequisite for a devotee to at least accept the principle that material activities aimed at sense gratification are a cause of suffering and repeated birth and death while service to Krishna liberates one from all the suffering of the material world and puts one on the transcendental platform. When Srila Prabhupada was physically present he had many problems with so-called devotees who didn’t even accept this basic principle. They were feigning Krishna consciousness to get some position, power, fame, wealth, reputation, followers and so on. For them Krishna consciousness was a totally mundane affair about exploiting other devotees and Srila Prabhupada’s ISKCON for their own personal benefit. In Prabhupada’s presence he somehow adjusted things so the preaching went on. It is one of Srila Prabhupada’s glories that he could take anyone, even an all-out demon, and engage him in Krishna consciousness. Even though these demons didn’t accept Krishna consciousness, Srila Prabhupada was able to extract so much service from them. After Srila Prabhupada’s disappearance, however, these materialists in the guise of devotees had an open field for their nefarious activities. For a devotee it is difficult to understand that someone, especially another so-called devotee, could not believe in Krishna or accept Srila Prabhupada as a pure devotee and worship him as being Krishna in the form of the spiritual master. These things are crystal clear to even the most neophyte devotee. However the grossly materialistic demons and the more subtle Mayavadis and impersonalists will never accept Krishna or His pure devotee. That is their nature. The demons can’t stand the pure chanting of Hare Krishna Hare Krishna, Krishna Krishna Hare Hare / Hare Rama Hare Rama, Rama Rama Hare Hare, nor can they bear to see devotees advancing in Krishna consciousness and the Krishna consciousness movement spreading all over the world. As a devotee is prepared to surrender his life, his energy, everything to preach Krishna consciousness, the demons are similarly prepared to sacrifice everything and dedicate their whole life and energy to stopping the advancement of the Krishna consciousness movement. Personally it amazes me how dedicated these demons are. They won’t stop their nefarious activities even though they are suffering greatly and it is as plain as day that Krishna is God, Srila Prabhupada is a pure devotee and they are demons. Still they want to be gurus and take as many disciples as possible with them to the darkest reigns of hell to suffer perpetually in the most unbelievable agony. So ISKCON became an organization run by these demons and the sincere fools and envious rascals who took initiation from the demons were dragged down to their level of consciousness. As a disciple of a pure devotee develops all the qualities of the demigods by serving a bona fide pure devotee spiritual master, similarly, a servant of a demon in the guise of a devotee develops all the qualities of the demons. This really changed the mood in the ISKCON temples. Even the devotees who were initially serious about serving Krishna and had some faith in Krishna consciousness were quickly contaminated by this very effective process of association with and service to demons. ISKCON had been transferred from a society that was turning demons into devotees to a society turning devotees into demons! Anything is possible in this dark age of Kali-yuga it seems. This reversal of the process caused great confusion and distress for devotees who were sincerely trying to become Krishna conscious but were getting the opposite result. Devotees would rise early in the morning, attend the temple program, hear the classes of the “pure devotee” preachers and go out all day selling Hong Kong oil paintings, or whatever was the most effective way to make money for the temple and their “guru,” but instead of decreasing their material desires, their material desires increased more and more. Many, many thousands of devotees went through this process and left the Hare Krishna movement in a worse state than when they joined. ISKCON was now bring out the worst in people, instead of reviving their long forgotten love for Krishna. Devotees subjected to this treatment suffered greatly. Some committed suicide, many went crazy and most lost faith in Krishna consciousness and went back to suffer in the material world.